The Foreign Language Department is looking for host families for the 2019-20 interns. The interns come to Brighton in October and stay through June, teaching TCMS and BHS language classes and sharing their culture. Families may host for the full year or half a year. Qualified residents of the Brighton Central School District will vote on the next year’s school budget along with other items on Tuesday, May 21, 2019 from 7 a.m. to 9 p.m. at Brighton High School, 1150 Winton Road South. The budget proposition would authorize the appropriation of $81,857,906 to meet estimated school district expenditures for the 2019-20 school year. Adoption of this budget would result in an anticipated tax levy increase of 4.89%, which is over the property tax cap. The Brighton Central School District has extended the deadline for the filing of petitions for election to the Board of Education until 4:00 p.m. on May 8, 2019. This action is required under New York Education Law due to the withdrawal by a candidate on April 23, 2019. Pursuant to law, the District has extended the nominating deadline by an additional 15 days from the date of the candidate’s withdrawal. Absentee ballots are available to qualified school district voters. An application for a ballot must first be completed. Requests for absentee ballots must be received by the District Clerk on or prior to May 14, 2019. Have questions? Need answers? 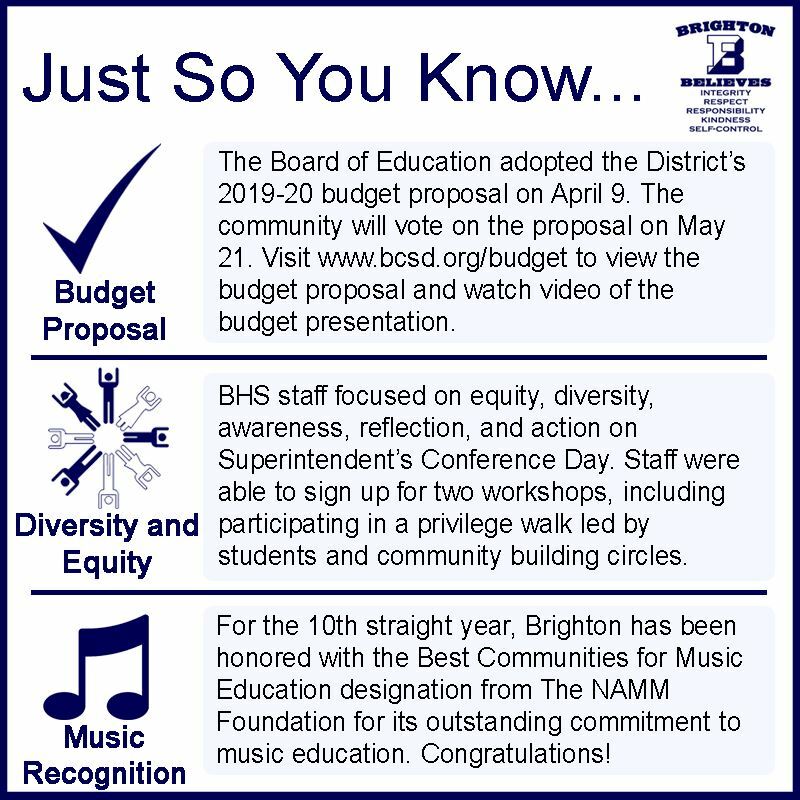 Would you like to know more about the Brighton Central School District’s 2019-20 proposed school budget before the May 21st vote? Students heard stories of inclusion and how to practice it every day from fourth grader Nora Cummins, her friend Everett, and Best Buddies of Rochester. 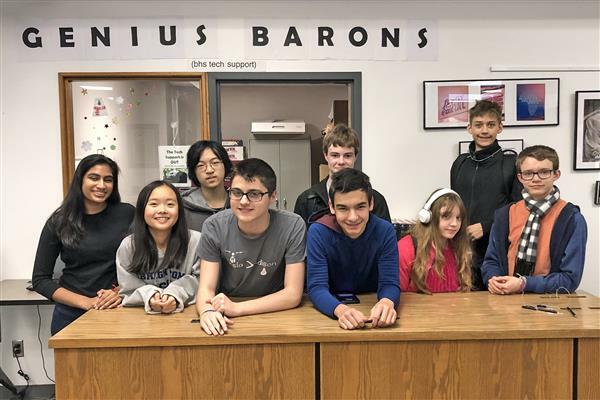 The student-run Genius Barons club is able to resolve computer problems through its help desk in the BHS library. Students in the club are available throughout the school day to assist their fellow students. 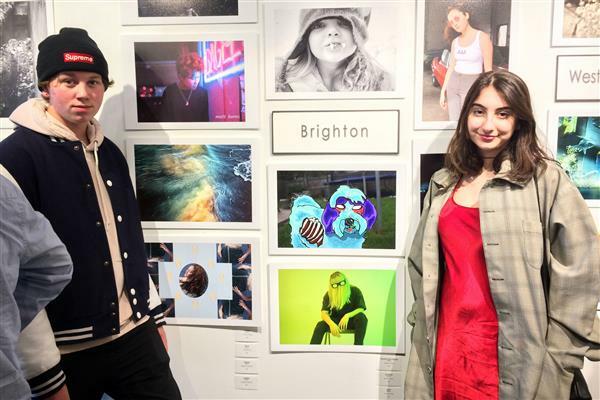 Representing Brighton were Matt Burns, Julia Lako, Ally McInroy, Corbin Merla, Noelle Nafus, Marija Petijevic, Becca Ryan, Sophia Scaravillo, Sammy Wille, and Hayley Zielinski. Brighton High School’s staff focused on equity, diversity, awareness, reflection, and action on Superintendent’s Conference Day on April 8. Staff members were able to sign up for two different workshops. 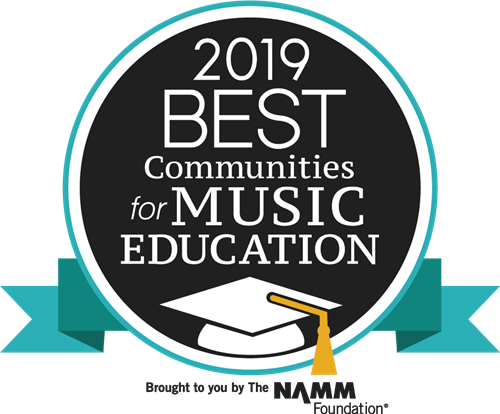 For the 10th straight year, Brighton Central School District has been honored with the Best Communities for Music Education designation from The NAMM Foundation for its outstanding commitment to music education. 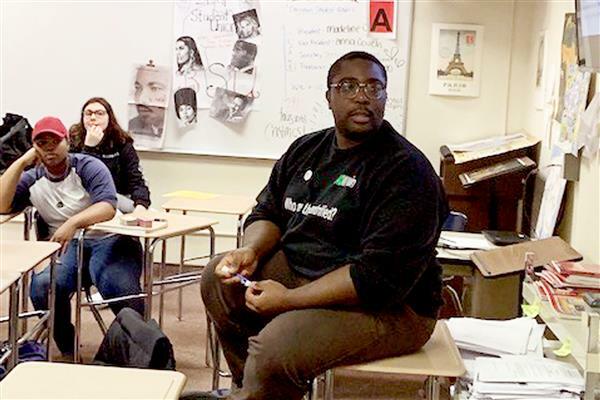 Brighton is one of just 623 districts across the nation receiving the prestigious award in 2019.